OAKLAND, Calif. -- It was a championship 52 years in the making. With 333 of the 336 regulation minutes through seven games of the NBA Finals in the books, the Cleveland Cavaliers and Golden State Warriors were tied 699-699. Then LeBron James kept the Cavs alive with a late, chase-down block, Kyrie Irving put them ahead for good with a 3-pointer with 53 seconds left, and the Cavaliers vanquished the championship curse of Cleveland once and for all. James, with 27 points, 11 rebounds, 11 assists and three blocked shots while playing 47 of 48 minutes, led the way. Irving -- 26 points and six assists -- followed in tandem. The Cavs, at long last, were on top of the basketball world with their first NBA title. It was won by the Cavs, but it is made all the more meaningful by decades of losing seasons from Cleveland's Browns and Indians, as well. "I don't know why the man above give me the hardest road, but ... the man above don't put you in situations that you can't handle," James said after the final buzzer on Sunday. "I just kept that same positive attitude. Instead of saying, 'Why me?' I said, 'This is what He wants me to do.' And Cleveland, this is for you." It took a native son -- the most important draft pick in franchise history 13 oh-so-lucky years ago, who was born and bred about 30 miles down the road in Akron, Ohio -- to break the cycle of disappointment. If back-to-back titles in Miami were James' breakthrough as one of the game's all-time greats, the championship in Cleveland represents his ascension to living-legend status. Forget The Shot, The Drive, The Fumble. The Land now has The Comeback, thanks to The King. His NBA Finals record still stands at a lopsided 3-4. It isn't nearly as stellar a bullet point on his résumé as his four MVP awards and his top-five ranking in all-time playoff points, assists and steals, but James' third ring carries so much weight. Hundreds of players have won the NBA title, but nobody has done it quite like James and the Cavs did this year. James dominated the series and pushed it to an improbable brink with back-to-back 41-point games to bring Cleveland back from a 3-1 deficit. The first 32 teams to fall down 3-1 in the Finals ended up losers. The Cavs, led by a certain No. 23, made sure that streak ended. The Cleveland Cavaliers came back from down 3-1 in the Finals to claim a 93-89 Game 7 victory over the Golden State Warriors to win the 2016 NBA title. A win by the Warriors would have solidified their place in the discussion of the greatest team ever. James' performance in the series changed the conversation and steered it toward consideration of him as the greatest player ever. He did it, of course, on the same court as the league's back-to-back MVP, Stephen Curry. Anyone watching could see by James' play that when it matters most, James remains the best the sport has to offer, with Curry a level below. 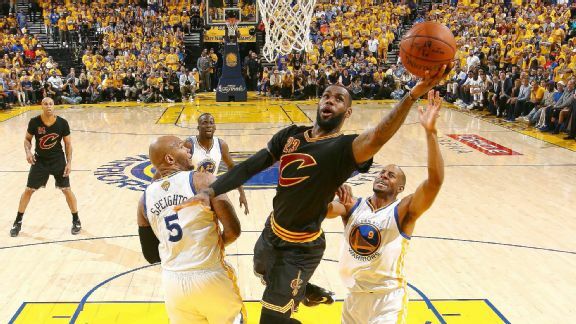 And he won the championship by elevating a group of teammates -- Kyrie Irving, Kevin Love and Tristan Thompson, with a combined zero playoff games among them before James came back to Cleveland -- to the game's zenith. As he posted in his homecoming letter in Sports Illustrated, "In Northeast Ohio, nothing is given. Everything is earned. You work for what you have." James and the Cavaliers outworked and outlasted the greatest regular-season team. Now, at last, the city of Cleveland can rejoice in a well-earned championship, one that will be remembered for the ages.